This organic chemistry tutorial video takes you through the IUPAC rules for naming Esters. Examples include naming simple and substituted esters, along with diesters. 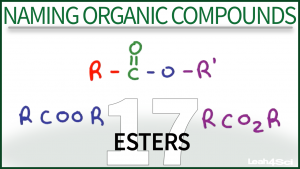 This is Video 17 in the Naming Organic Compounds Video Series. Click HERE for the entire series. Why is it called propyl ethanoate if the propane carbon chain is longer than the ethane carbon chain?